If you love food and relish the idea of making people healthy through your own special recipes and cooking tips, then consider a career as a personal health chef. This is a unique career area that many people have never heard about or even contemplated for a career. But, it's a hugely important health career that can address concerns such as obesity, heart disease and diabetes – all of which require healthy eating to reduce the symptoms and signs of the diseases. 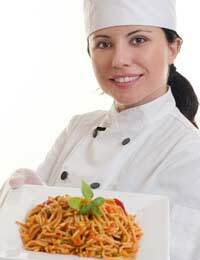 A career as a personal health chef holds numerous options for employment, ranging from a health chef position employed by one person or a single family – to employment for a company that provides catering services for customers who want balanced, healthy meals. Another interesting area involves therapeutic treatment of disease through nutritional recipes. For people who suffer from heart disease, for instance, you could work in their home or in the kitchen of a company. You may even perform independent contract work at a kitchen within your home. You would cook meals regularly or occasionally for someone who needs meals specifically tailored to a diet required by a dietitian or nutritionist. Alternately, you might work with that person to show them ways to improve their usual food menus. Some personal health chefs may begin by completing an undergraduate degree in dietetics. They may work as registered dietitians before applying that knowledge to their natural skills in the kitchen. Others may be trained chefs with an interest or specialty in cooking healthy or organic food. Generally, you should have some education in the nutritional sciences and ideally this would be combined with a certificate or diploma course in general cooking or a specific kind of cuisine. Another beneficial area in which to train is fitness. By providing clients with supportive fitness recommendations, your clients can reap the most benefit from their eating habits. In particular, if you specialise in working with obese clients, your education in fitness can make an enormous difference to the success of their weight loss and overall health. Many of us have probably heard about personal health chefs for the 'stars' – celebrities who employ their own in-house health chefs to keep them looking lean and svelte. While the vast majority of personal health chefs likely won't be in this role, it is still an exciting and lucrative one that motivated individuals can consider for a career. Wages will vary a great deal for this kind of role, depending on whether you are self-employed or receiving a consistent salary from a company. At the top of the ladder are those who provide expensive services to celebrities and wealthy individuals while at the lower end are those who may work freelance and less regularly. If you do commit fully to the career, however, you can earn a good wage, particularly because this kind of position often works well via word-of-mouth, which means clients will recommend you to friends. Not only that, but if you provide quality work, clients will likely continue to return for your services. The role of a personal health chef is a rewarding one because you not only create delicious, visually appealing meals but you also do so with respect for the principles of nutrition and health. You can watch your clients reach their health goals, which can range from weight loss to reducing cholesterol or simply living life with more energy and a greater sense of wellness. MorningI would like to know if a hearh chef profesin wil be sustible for Me. You can see more information via the National Careers website link here. I hope this helps. Morning I would like to know if a hearh chef profesin wil be sustible for Me. How would I go about upskilling to be a personal dietitian for individuals in their home. How some people would employ their own personal dieititan. Are there really jobs like that out thee or only in USA?